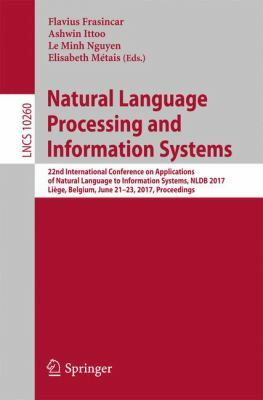 This book constitutes the refereed proceedings of the 22nd International Conference on Applications of Natural Language to Information Systems, NLDB 2017, held in Liege, Belgium, in June 2017. The 22 full papers, 19 short papers, and 16 poster papers presented were carefully reviewed and selected from 125 submissions. The papers are organized in the following topical sections: feature engineering; information extraction; information extraction from resource-scarce languages; natural language processing applications; neural language models and applications; opinion mining and sentiment analysis; question answering systems and applications; semantics-based models and applications; and text summarization.